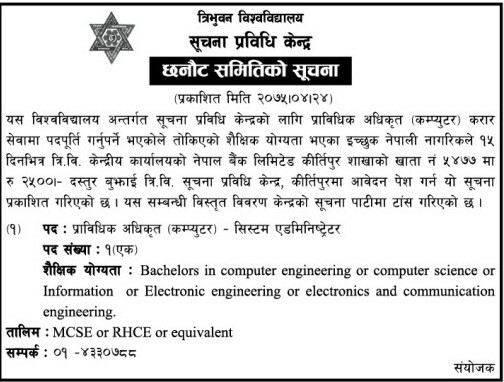 Tribhuvan University, Department of Information Technology is seeking an application from an interested Nepali citizens to fulfill the given post on a contract basis by Bhadra 7, 2075 (23 August, 2018). The applicant should submit Rs. 2500 to TU Central Department of Nepal Bank Limited, Kirtipur Branch Account Number 5477.